I was inspired to write this post after reading an article in our local newspaper “De Gelderlander” and another one “Consumenten gids”. Both of them covered the topic of minced meat and the fat percentage. According to European regulations such as (EC) No 1162/2009 or (EU) No 1169/2011 there are specific requirements concerning the designation of minced meat – see table below . 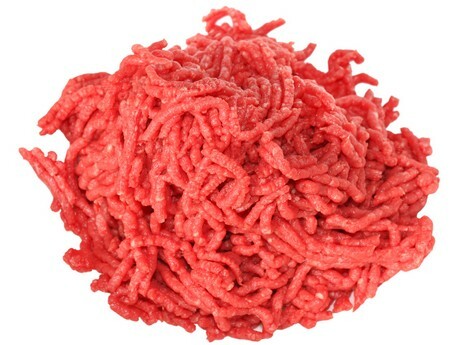 For regular minced meat it may contain between 20-30% fat. That’s quite a lot. It means, after thermal processing, you’ll loose about 1/5, 1/4, or 1/3 of the original volume. According to Dutch legal norms the maximum fat percentage in minced meat is 25%, while in its lean version 15% . 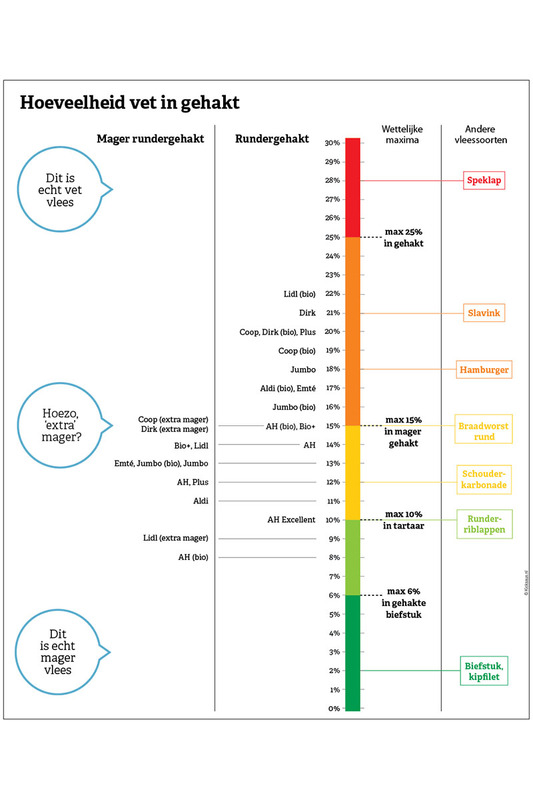 The Consumers Association “Oprecht Consumentenbond” has checked 59 types of minced meat. The first thing they found out is that a regular minced meat from a butcher is less fat than lean minced meat from a supermarket. For example minced meat containing pigmeat had on average 19% of fat, minced pure beef had 17%, while the ones from a butcher had 13% less fat. Incredible! Luckily there are organisations that promote healthy lifestyle and eating habits such us Dutch feeding center “Voedingscentrum”. Accorting to its drive five initiative so called “Schijf van Vijf” only meat having less than 10% fat is advised to consume . Mostly because animal fat contains lots of saturated fat which is unhealthy to people due to increasing bad cholesterol (LDL). “Voedingscentrum” also advise to reduce quantity of meat consumption and heavily promote vegetarian dishes. What do I do? Since couple of years I reduce quantity of meat and since couple of months I consume meat only from butcher… What actually surprised me was that the prices aren’t higher. Yes, it costs me extra time and without a car I couldn’t reach that place but luckily I have one and believe me, the quality of meat is so much better. No extra fat added, any other animal leftovers, water or chemicals to reduce the costs. This meat taste real and good. You go and pay fair price. There is no-one in between. This in fact is a win-win situation. I recall reading few months ago an article, also in “De Gelderlander”, which mentioned that there are less and less butchers in the Netherlands because consumers want cheaper food and don’t care that much about quality. That is also the reason why I want to support butchers. I also believe meat available at small slaughterhouse is from animals raised and treated in better way than the ones used for meat sold to supermarkets. Tip? Start eating less meat, buy meat from butchers. If you have not that possibility and you still buy minced meat in supermarket choose the one that is animal friendly (ironic statement) and buy lean minced meat with the lowest fat percentage e.g. “tartare” . Ok, that is it… I hope I made you start thinking about what meat you eat and planted a seed to your future healthier change. Thanks for being with me. Please share this article if it made you thinking. If you are interested in my other posts, I encourage you to make use of “Post Index” where you can locate and learn about all the posts on my blog. Regulation (EU) No 1169/2011 of the European Parliament and of the Council of 25 October 2011 on the provision of food information to consumers…, Annex 6, Part B. Since couple years I am continuously reading a lot of books and articles about food industry, and watching documentaries in regard to this topic. My interest concerns not only food but also daily life products such as cosmetics, packaging, dyes, electronics, toys, and clothing! I am terrified with the negative health effects that these items have, including high amount of people with cancer. This seems to be the most common “killer” of today’s society. I bet all of us know at least one person who has/had cancer. I’d like to shed some light to scientific jargon and then show you the list of products containing EDCs. The reason of many new, serious civilization diseases are among others EDCs (endocrine disrupting chemicals) such as: brominated flame retardants, well known Bisphenol A (BPA), phthalates (four types: Diethylhexyl phthalate (DEHP), Dibutyl phthalate (DBP), Di-isobutyl phthalate (DiBP) and Benzyl butyl phthalate (BBP)- these are luckily already banned by REACH* in toys and children’s products and will be restricted in electrical equipment by RoHS** from July 2019). Unfortunately the list continues and there are even more substances listed by the EU as Category 1 potential EDCs including several other phthalates, tributyltin compounds, Polybrominated Diphenyl Ethers (PBDEs), nonylphenols and their ethoxylates, octylphenols, Short Chain Chlorinated Paraffins (SCCP) and several metals including aluminium and copper. Let’s focus now a bit on a definition of endocrine disruptor, the definition developed by the World Health Organisation (WHO) and widely used on a global basis: “An endocrine disruptor is an exogenous substance or mixture that alters function(s) of the endocrine system and consequently causes adverse health effects in an intact organism, or its progeny, or (sub) populations”. These harmful effects on humans (and animals) are: sexual dysfunction, loss of fertility, cancer, hindrance in natural hormone production resulting in destructive effects on metabolism, hair loss, obesity, growth and development, sleep and mood… Shall I list more? As you see, in the marathon for more, cheaper, smaller/bigger, whatever you think of… in the race for better future we kind of forgot about our health and the natural environment. Luckily there are great initiatives such as the one started by a group of young researchers from Gdańsk, Poland (my hometown:)), owners of Detoxed Home LLC business, an initiative called “Detoxed Lifestyle Challenge” . Their mission is to show and implement recommendations for reducing exposure to endocrine disrupting chemicals (EDCs) in daily life. Their challenge is to change the lifestyle into free from EDCs, without sacrificing the benefits of the civilization. If you want to read more about Detoxed Lifestyle Challenge I encourage you to subscribe to their page, here. I fully support their mission and join the challenge as well. It’s not possible to avoid all products… But you can try to make at least small steps, same as I did. I was scrolling my old pictures and found this one. These were vegetables that I got in May in my organic package. If you see that photo you may indeed link these vegetables to that period of the year. How misleading that is… Nowadays with all greediness for highest revenue, food became a part of intense, unhealthy manufacturing industry. I do not write about processed food, there is no doubt this kind of food is produced with purpose to make the manufacturers, brand owners richer and more influential. I am writing about unprocessed food, such as fruits or vegetables. Expensive marketing tricks made people believe they need to eat a strawberry or a tomato in winter. Do you really need that food in winter? No you don’t. What you need are products that provide lots of vitamins and minerals, food that is as little processed as possible, food that will grow during the season, it will be cultivated outside in soil, not coming from hot-/greenhouse farming. Some time ago I came across an interesting green, leaf veggie, also known as “Japanese Mustard Spinach”. It was very similar to bok choy but tasted differently. I decided to experiment and made tagiolini with komatsuna and cheese. The addition of crème cheese and blue cheese gave it a creamy structure and defined taste. Please have a look. Cut mushrooms in thin strips, chop onion and fry. Tear komatsuna into pieces and fry with the rest of vegetables. Strain the tagiolini and pour in a dish. Top with vegetables and cubes of blue cheese. Top with 1tbsp. crème cheese and parmigiano. Oh my God, this recipe is so delicious!!! I had two courgettes in my fridge and I wasn’t really sure what to use them for… They were a week old and I had no ingredients for pasta. I usually add them to my pastas. I wanted to make cutlets but because my son is allergic to eggs I did a vegan version, so no egg. He is also allergic to wheat therefore I needed to think of my own substitutes for the common ingredients such as wheat flour or bread crumbs which us usually add to any kind of cutlet. I gave it a try… I am more than surprised with the result. I will definitely be making it more often. Grate courgette, sprinkle with salt, approx. 1,5tbsp. Blend well. After approx. 10 minutes drain courgette. Place in a blow squeezed garlic, soy sauce, lemon juice, backing powder, spelt flour, sugar, salt and pepper. Blend all ingredients. Add drained courgette and mix. Make cutlets and sprinkle from both sides with ground oat bran. Have you ever been in the Netherlands and tried poffertjes? These are small, fluffy pancakes which are usually served with butter and powdered sugar. I love them. My son unfortunately cannot eat them because he has an allergy to all ingredients that are used for the poffertjes. Inspired by my husband’s family member I made a small change used yoghurt instead of milk. Also the other ingredients were adjusted to my son’s needs. The result was slightly different because of little sour taste from yoghurt and you could taste a bit of soy (I used soy yoghurt) but we still loved it. I am curios if you liked it too. I encourage you to go for traditional recipe and use normal caw milk or experiment a bit like me and use caw/soy vanilla yoghurt or quark. I think you will like all versions of this recipe. Combine soy yoghurt, quail eggs and pinch of salt. Whisk smooth. Add spelt flour and whisk smooth again. The cake must be as for pancakes, therefore play around with yoghurt and flour in case the structure is too thick or too loose. Heat oil, add soup spoons of the batter and create mini pancakes. Fry from both sides until poffertjes become nicely golden. I was looking for an interesting, vegan cake recipe on-line. I couldn’t find anything with the limited ingredients I had at home. Therefore I decided to risk and did this. The result was great! 2 cups of spelt flour. 1 package of backing powder (for 500g flour). 1/2 cup of sugar (I used the brown one). 4 tablespoons of maple syrup. 1/2 cup of vanilla soy yoghurt. 1/2 teaspoon of vanilla aroma. Pour 1,5 tablespoon of linseed in 3 tablespoon of hot water. Wait approximately 3 minutes. Add soaked linseed, eggs, vanilla soy yoghurt, maple syrup, vanilla aroma and oil to the dry ingredients. Mix until smooth consistency. Add raisins and mix with a spoon. 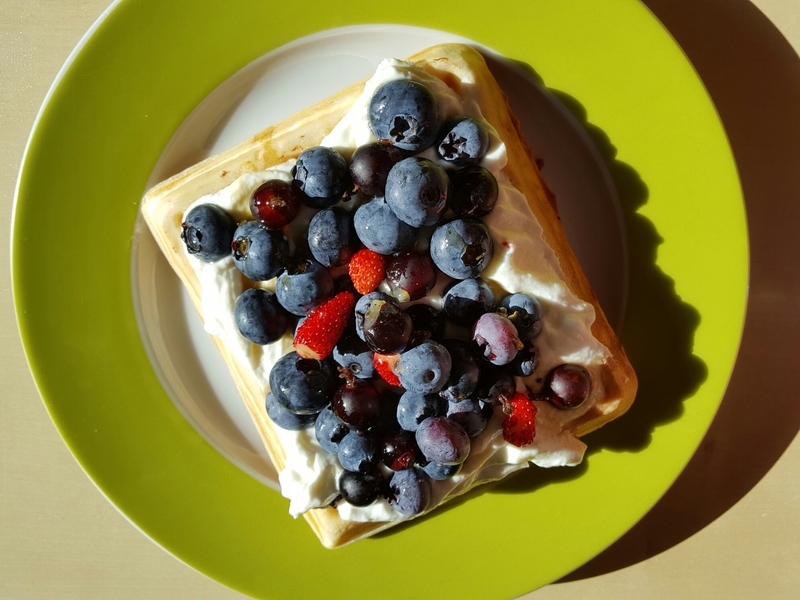 What I ate on Monday… My delicious breakfast! 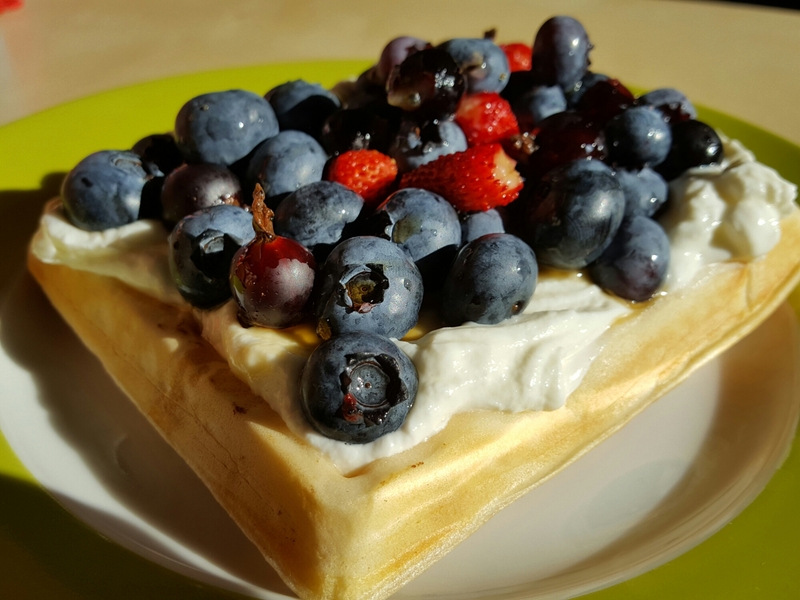 I spreaded fromage blanc, decorate the waffle with freshly picked up fruits from my garden (gooseberry, blueberry and wild strawberry) and pour with maple syrup… Yummy!!! It was so delicious!!! Do you like waffles too?